Howard Roberts (1929-1992) has had one of the most multi-facted and colorful careers in guitar history. A true Renaissance Man of the guitar, he was a brilliant jazz artist, a studio pro par excellence, a profound and insightful educator, an imaginative inventor, prolific author and deep thinker. The story of his musical journey is one the most inspiring in guitarlore. Howard Mancel Roberts was born on October 2, 1929, in Phoenix, Arizona. A self-proclaimed "desert rat," he began playing the guitar at an early age. Howard received his first instrument, a Gibson Kalamazoo acoustic costing about $18.00, when he was 9 years old. He began sitting in with local jazz musicians when only 11, and turned pro by the time he was 15; working then with the likes of Art Farmer and Pete Jolly. Roberts studied guitar with Horace Hatchett during this period and was introduced to the styles and techniques of players like Django Rheinhardt, George Van Eps and Barney Kessell. His training with Hatchett was supplemented with guitar playing and learning insights from Howard Haitmeyer. He also studied the Schillinger system of composition, a mathematical approach to music, with Fabian Andre when he was 17. In 1950, Howard made a fortuitous move to Los Angeles. He lived a vagabond life, subsisting on chocolate chip cookies, sleeping in cars, and jamming in after-hours clubs before meeting arranger-guitarist Jack Marshall at the Hague through Barney Kessell. Howard consequently met, proved himself and worked with L.A.'s best musicians including Bobby Troup (who wrote "Route 66") and Chico Hamilton. On the basis of his considerable abilities, he was rapidly drawn into the inner circle of the L.A. music scene receiving rewarding work in the recording studios, TV, on tours and as Director of Guitar Curriculum for Westkake College of Music (the first accredited vocational music school in the U.S.). He divided his efforts as jazz artist, touring and studio musician and educator in the fifties. His contract with Verve Records produced several fine Roberts jazz guitar albums including the early bop guitar classics Mr. Roberts Plays Guitar and Movin' Man and the adventurous Velvet Groove. In the sixties Howard was one of the busiest recording artists in the world. He signed a new record deal as a leader with Capitol Records and released an excellent and eclectic series of albums for the giant label. Landmark recordings of the catalog include Color Him Funky, H.R. is a Dirty Guitar Player, Somethings Cookin', Whatever's Fair, Jaunty Jolly, and Goodies. His work featured solid bebop playing on standards and show tunes, blues, gospel, funk, and even rock and pop numbers. As such Howard Roberts was the prototype fusion guitarist. Who else but Howard could make a pop throwaway like "Winchester Cathedral" swing as hard as anything played by Wes Montgomery or Joe Pass? In the studio Roberts became one of the most listened-to guitarists in contemporary music, lending his unique and musical touch to movie soundtracks and TV shows like The Twilight Zone, The Munsters, I Dream Of Jeanie, and The Beverly Hillbillies. He also recorded with Frank Sinatra, Elvis Presley, Ray Charles, Sammy Davis Jr., the Beach Boys, Merle Travis, Nat King Cole, Little Richard, Ella Fitzgerald, Sonny and Cher, the Jackson Five, Rick Nelson, the Supremes, and literally countless other stellar performers on hundreds of session dates. He earned the title of "the fifth Monkee," as he played on virtually everything the group recorded in the 1960s. At that time Howard designed the Epiphone Roberts model guitar and formed the Benson amplifier company. He epitomized the persona of the guitar virtuoso/studio whiz which established the pattern followed by Larry Carlton, Lee Ritenour, Steve Lukather and many others in the ensuing decades. That of living legend, a hot player burning up the studios by day and bringing down the house in jazz clubs by night. Some of this legendary playing thankfully has been captured, preserved and released on CD by V.S.O.P. Records in the Howard Roberts "Magic Band" live sessions from Donte's. In 1970 Howard became more deeply involved with education. He founded Playback Music Publishing Company to upgrade the state of contemporary guitar literature. 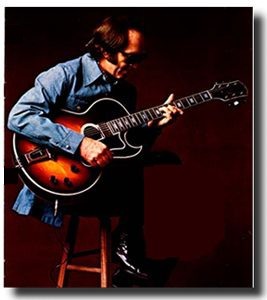 Amidst his hectic playing schedule he wrote an innovative series of instruction books such as The Howard Roberts Guitar Book, Chord Melody, Sight Reading, Super Solos, Super Chops, and Instant Blues. Out of this series grew the Howard Roberts Guitar Seminars of the 1970s and eventually G.I.T. (Guitar Institute of Technology), the world's first vocational school for guitar, now known worldwide as M.I. or Musician's Institute. The material Howard developed in his books and seminars was the basis for the core curriculum at the institute. He expanded many of these initial concepts in his Praxis and Chroma systems for guitar education. Roberts even anticipated distance learning, interactive correspondence programs, and the educational implications of the internet, though it didn't yet officially exist in the mainstream, in a conversation we had back in 1991. Howard redesigned the Howard Roberts model for Gibson in the seventies and added the innovative thin-body Howard Roberts Fusion guitar. He moved to Edmonds, Washington, in the eighties. Roberts continued to develop his groundbreaking educational programs until his death on June 29, 1992, at the age of 62. Howard Roberts guitar style can be truly described as eclectic. Few can play with the combination of fly-by-the-seat-of-your-pants abandon and excitement, virtuosic finesse, imagination, and soulful blues feeling that Howard generated...often within a single phrase! Roberts was a astonishing improviser of jazz guitar and one of its greatest innovators. There wasn't an element of music he didn't explore and apply in his approach--melodic, rhythmic and thematic development, harmonic experiments, counterpoint, texture, sound effects, dynamic contrasts and phrasing nuances. His style is as modern and awe-inspiring today as it must have seemed when he first floored audiences back in the fifties and sixties. In the sixties Howard pioneered a style of jazz rarely heard in the genre. His solos in the apex of the Capitol period (1963-1968) were unusually concise and compact and the tunes themselves averaged two minutes or so in length, a significant departure from the lengthy blowing of most jazz recordings to this day. In what would have been a rigid and constricting environment for most jazz soloists Howard was an unstoppable creative force; fashioning improvisations of great clarity and logic delivered with an unbridled energy and unpredictable phrasing. He treated his listeners to the full spectrum of his musical experience in a microcosm, wherein each solo was a memorable gem. Roberts' improvisations were immediately recognizable and filled with his musical trademarks. In addition to his technical command of the hard bop vocabulary he employed intervallic sounds based on odd finger patterns which he called "sonic shapes." These produced striking angular melodies within otherwise brilliant but more conventional jazz lines. Howard also juxtaposed earthy blues and funk licks freely into his playing creating unexpected mood swings while improvising. Howard described his alternate picking technique as "circle picking." "Circle picking is a thing that came as a result of my playing bebop when I was a kid. There was no conscious attempt on my part to develop it; it just happened to accommodate the music I was doing. It was the only way I could get the notes out. I use the fingers and wrist when I pick. You know how most people write, by moving their thumb and forefinger. ...Just like writing your name across the strings." Howard Roberts was once described as a jazz guitarist who could play anything. Add: with a sound to match. A true musical chameleon he was one of the genre's greatest jazz players and also one of the most recorded guitarists in commercial music history. When performing in the studio as a "first call" guitarist he reached into a large trunk and invariably came up with the right tool for the job every time. By the late seventies his studio trunk contained a large number of instruments: a 6-string bass, a flat-top acoustic, an arch-top acoustic, a 12-string acoustic, a couple of hollow-body electrics, a mandolin, a ukulele, a banjo, a Les Paul, an ES-335, and other solid bodies. For rock sessions Roberts generally used an old Fender Broadcaster with light strings. As a jazz instrumentalist Howard Roberts played a number of guitars during his career. In 1950, when he first arrived in L.A., Roberts had a Gibson L-5 acoustic cutaway model with a DeArmond pickup. Howard's later publicity shots from the Verve Records stint as well as the cover of Mr.Roberts Plays Guitar picture him with an early-to-mid fifties Gibson ES-175. This was his preferred guitar through the Verve period. The ES-175 had a 16 1/4-inch body with a laminated maple top, sides and back. Howard's ES-175 was a sunburst finish model equipped with a single P-90 pickup mounted near the fingerboard. This instrument was most likely heard on Roberts' Verve jazz albums from the fifties such as Velvet Groove and Movin' Man. Bop Blues, "Relaxin' at Camarillo"
By the time he secured his recording contract with Capitol Records, Howard Roberts was sporting a signature guitar which he used on and off throughout the coming decade. This was a one-of-a-kind instrument, a highly-modified ES-150 (the Charlie Christian model), which had previously belonged to Herb Ellis. Modifications included conversion to a customized single-cutaway shape, black paint job and the replacement of the original bar pickup. The control knobs, headstock, pickguard and tuning keys were also changed. Howard was an innovator and guitar designer in addition to being an astonishing player. By the mid sixties he began developing a series of unique instruments, some of which remain available to the present day. The trend began in 1961 when Howard was approached by Les Prop, an exec at CMI (Chicago Musical Instruments, a company which controlled both Gibson and Epiphone), to design an Epiphone signature model. The result was the Epiphone Howard Roberts model. Co-designed by Andy Nelson, this namesake guitar was introduced on Capitol's Something's Cookin' album, recorded in July-August of 1964. The Epiphone Roberts was essentially an ES-175 upgraded to better wood, equipped with a single floating mini-humbucking pickup mounted at the end of the fingerboard and an oval soundhole instead of the traditional f-holes. It was offered in both Custom and Standard models. Howard was most often seen with a walnut-finished Custom, as depicted on the cover of 1965's Goodies. Howard later re-designed the Roberts model guitar for Gibson. The Gibson Howard Roberts model was introduced in 1974 and was different from its predecessor in several respects. It had three controls: volume, mid-range and treble-off, a full-size humbucking pickup, and a 25 1/2-inch scale length fingerboard. Howard was pictured with this guitar on the cover of his Real Howard Roberts album recorded for Concord. Swing Standard, "Gone with the Wind"
Howard always strung his arch-top electrics with extra-heavy Gibson Monosteel strings: .016-.018-.028.-.038-.048-.058. His pick was a medium-heavy celluloid type gauged about 37/1000 of an inch. Roberts employed a variety of amplifiers in his career. Through the fifties he chose a Gibson GA-50 for his jazz sound, which he described as a flat woody tone. This distinctive combo amp had a finished wooden cabinet and two different-sized speakers, a 12-inch and a 10-inch, in the same enclosure. Howard chose a Fender Pro for rock, country and pop studio dates. He later replaced both amps in the sixties with a 100-watt Benson 300 amp, which he co-designed with electronics expert Ronnie Benson. The Benson amp featured linear tone controls (flat at the mid-point), reverb and tremelo. A plug-in equalization module was included which extended the tone-shaping characteristics and response of the amp further. The idea was to deal with the sonic discrepancies of a wide variety of guitars with a single amplifier. The Howard Roberts' Guitar Book. Written by Howard Roberts and James Stewart. A 50-page guitar manual which splits the difference between a method book and a free-form exposition of essential guitar licks. An all-time classic covering Howard's approach to picking, comping, improvising, fingerboard technique and chord solo playing. Eclectic, insightful and entertaining, like the man. Super Solos. Written by Howard Roberts with Ron Eschete. A 48-page collection containing eight of Howard's transcribed solos from his entire career with performance notes. The transcriptions, presumably by Eschete, contain fingerings and position markings. Howard Roberts Guitar Manual: Chord Melody. Written by Howard Roberts. A 58-page treatise on Howard's unique approach to fingerboard harmony. An essential CD reissue of H.R. 's first two Capitol albums Color Him Funky and H.R. is a Dirty Guitar Player. A great H.R. site containing rare photos, including a clear shot of the much-modified "mystery guitar" on the home page. This site also features rare radio interviews with Howard regarding the making of several classic Capitol albums. The details of recording sessions as leader and sideman are extensive and well-documented.